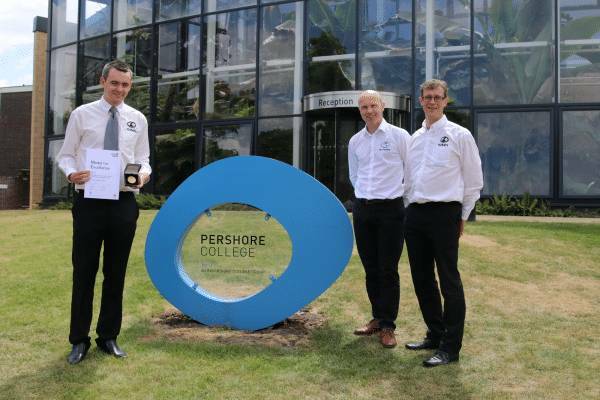 Pershore College is celebrating the success of two of its engineering apprentices being awarded a Medal for Excellence by the educational organisation City and Guilds. Luke Hill and Matt Davis, who are land based service engineering apprentices, were presented with their medals at the college on Tuesday 10 July in recognition of their exceptional talents. Both have gained Level 2 Diplomas in Work based Land based Service Engineering (Groundcare). The prestigious Medals for Excellence have been awarded by the City and Guilds Group for over 100 years. They celebrate exceptional talent among learners who have achieved great results by not only producing exceptional work, but by going above and beyond what is expected to achieve their goals.